What is the hardest part of your body? Answer: your enamel. Your enamel is the outer layer of your teeth that makes them so durable and strong, however it has a kryptonite. Sugar causes immense damage to your teeth in a unique manner. It is super food for the bacteria that live in your mouth, allowing them to reproduce and create sticky masses of bacteria called plaque. The bacteria produce acid, which is what destroys the enamel. Etching pockets in your teeth, the bacteria become nestled and start to form cavities. Enamel does not run all the way through your tooth. The other layers of your teeth are not so durable and corrode very quickly. Each little bit of sugar causes an explosion in population for the bacteria, which causes more acid to tear the tooth’s defenses apart. 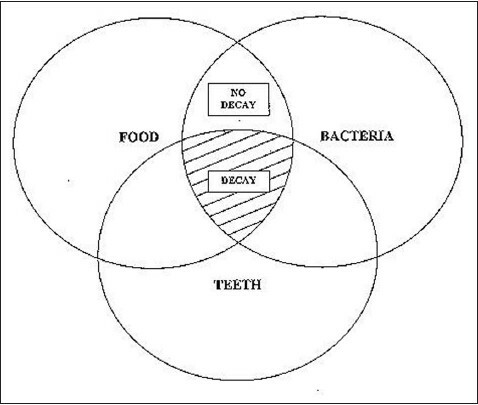 The three components, tooth, sugar, and bacteria, create the triangle of tooth decay. This trinity of tooth destruction takes make in our mouths every day. That is why it is so important to do daily dental care because, after all, you only have one set of adult teeth. For more information on preventative care and proper teeth cleaning, check out our other blogs.